Ok... here's another kind of reflection. Reflect on how this puppy sounds. This should be pretty straightforward but GUESS. Send me your guess by PM and I'll acknowledge the first 2 right answers. PhilUK .. this one's for you .. some heavy N/American Iron. You cannot depend on your eyes, when your imagination if out of focus. My brush is a welder and my canvas is a peice of metal. I love this RED!! and what a wonderfully clean engine! woohoo..I bet this car can GO!!!! but these are all gettin too hard for me to figure out...vvvvvvvrrrrrrrrrrrooooooooooommmmmmmm!!! In my mind the engine is the best part of that car. i like to eat pie! Everybody together now..... HEMI!!!! I love these car pics! I'm not a car buff but I know a good photo when I see one. 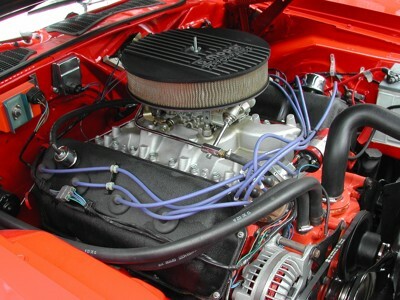 This is a perfect picture of what looks like a poerfect engine.Great work. Couldn't be any clearer or sharper. the Old Nascar days.. right??? that type of stuff as well.